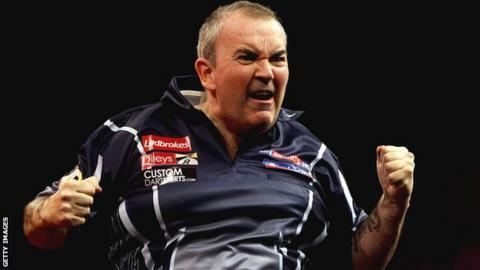 World number one Phil Taylor has been drawn against Stuart Kellett in the first round of the World Matchplay, which starts in Blackpool on 20 July. Elsewhere, in-form Michael van Gerwen, who hit a nine-dart finish in last year's tournament, plays 2005 Matchplay winner Colin Lloyd in round one. Newly-crowned European champion Adrian Lewis faces Ronny Huybrechts, while Simon Whitlock takes on Jelle Klaasen. Taylor has won the World Matchplay title, widely considered to be the second most prestigious event in the PDC calendar behind the World Championship, on 13 occasions. He last suffered defeat at the Winter Gardens in 2007. Kellett, meanwhile, is currently ranked 43rd in the PDC Order of Merit. First round draw: Phil Taylor v Stuart Kellett, Terry Jenkins v Andy Smith, Raymond van Barneveld v Mensur Suljovic, Justin Pipe v Mark Webster, Simon Whitlock v Jelle Klaasen, Kevin Painter v Jamie Lewis, James Wade v John Part, Mervyn King v Gary Anderson, Michael van Gerwen v Colin Lloyd, Kim Huybrechts v Peter Wright, Wes Newton v Jamie Caven, Dave Chisnall v Paul Nicholson, Andy Hamilton v Ronnie Baxter, Robert Thornton v Ian White, Adrian Lewis v Ronny Huybrechts, Brendan Dolan v Steve Beaton.